President Trump signed a two-year budget package today, ending the second government shutdown of 2018, albeit a short one of about eight hours. Congress passed the measure after a delay forced by Sen. Rand Paul of Kentucky, who protested that it was fiscally irresponsible. "When Republicans are in power, it seems there is no conservative party," Paul said during the debate. He called the package "a bipartisan looting of the treasury,'" Lisa Mascaro reports for the Los Angeles Times. USA Today calls the package a "whopping ... basket of goodies," such as $1 billion for dairy and cotton producers, lower prescription-drug costs for seniors, higher premiums for wealthy Medicare patients, and $6 billion for the opioid epidemic. It includes $20 billion for infrastructure initiatives, some of which will go to broadband build-outs, John Eggerton reports for Broadcasting and Cable. The bill also includes almost $90 billion in disaster relief for areas hurt by last year's hurricanes and wildfires, funds community health centers, and extends the Children's Health Insurance Program for an extra four years, beyond the six years recently approved, but "would cut $1.35 billion in funding . . . meant to improve public health and prevention funding for states and municipalities," the Minneapolis Star Tribune reports. "The bill continues a special tax rate of 23.8 percent for 2017 for gains from timber sales, a break from the top rate of 35 percent that would have otherwise applied." Also, the StarTrib reports, "The bill extends a tax credit for 20 percent of an employer’s spending on mine rescue team training costs, up to $10,000" and "allows the immediate deduction of a company’s investment in mine safety equipment." Also on the coal front, "The package included a new tax credit for carbon-capture projects with support from across the ideological spectrum in the Senate," Dino Grandoni reports for The Washington Post. A “diverse group” of senators helped get it through, said Democratic North Dakota Sen. Heidi Heitkamp, "who has at least three carbon-capture projects in her state." She also "said the fact that Senate Majority Leader Mitch McConnell, representing coal-country Kentucky, had been a co-sponsor on the legislation 'absolutely helped'." McConnell had at least two other goodies for Kentucky. The bill will exempt private Berea College from a provision of last year's tax-reform bill that would have taxed its endowment, Eliza Collins and Maureen Groppe report for USA Today. He also inserted an exemption for the state's Southeast Community and Technical College, which was in danger of being disqualified for federal student loans because of a high default rate. McConnell could also be credited with the bill's preservation of tax breaks for owners of racehorses (primarily bred in Kentucky) and racetracks like Kentucky Speedway. Do you like bird watching? Are you a science fan? In just 15 minutes you can combine those two interests and help scientists understand more about our world's birds during the Great Backyard Bird Count from February 16-19. Click here for more information. 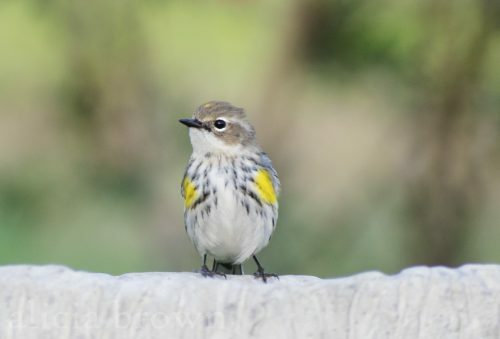 A yellow-rumped warbler, from the 2017 photo contest. Launched in 1998 by the Cornell University Lab of Ornithology and the National Audubon Society, the GBBC was the first online citizen-science project to collect data on wild birds and display the results in almost real time. More than 160,000 people from all over the world take part in the four-day count each year. Participating is simple: for at least 15 minutes during the count, just tally the numbers and kinds of birds you see, from wherever you happen to be. Create a free online account to enter your count. And if you like photography, enter the photo contest! Click here for the rules, click here for a gallery of the gorgeous entries from 2017, and click here for a list of prizes. Though the Federal National Mortgage Association ("Fannie Mae") and the Federal Home Loan Mortgage Corporation ("Freddie Mac") have had limited reach into rural America, the government-sponsored mortgage giants have new plans to make it easier for rural homebuyers to get a loan. 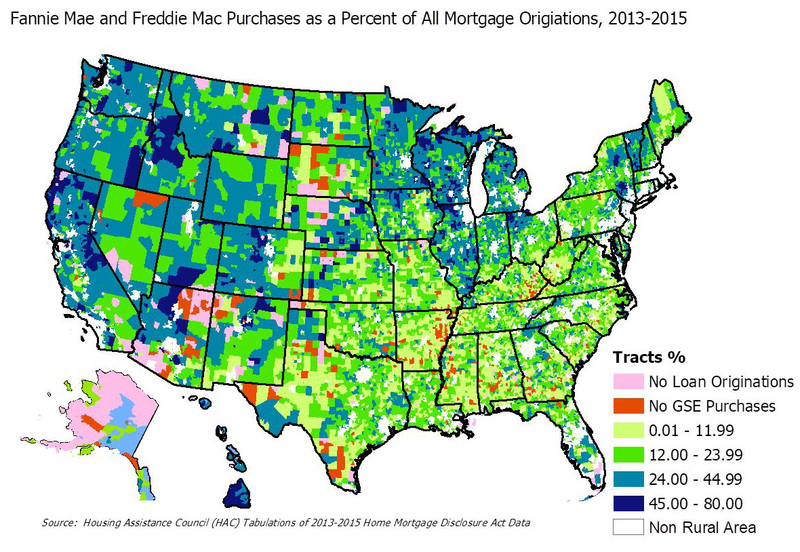 The two companies own almost half of all U.S. mortgages, but only 12 percent of the rural home loans that were initiated between 2012 and 2015. "The most effective approach would be for Fannie and Freddie to partner with existing housing providers, nonprofits, and tribes, who already work in these communities," George writes. "These entities have the experience, local trust, and insights to help Fannie and Freddie in these often hard to reach areas. Ultimately, rural America is a big place, with many different housing markets. To make this plan a success, Fannie and Freddie will need to better understand these often-forgotten markets, and commit meaningful efforts and investment." The Environmental Protection Agency pulled funding from a monthly newspaper covering the Chesapeake Bay, possibly because of stories and opinion pieces critical of Trump administration policies. The Clean Water Act requires EPA to keep the public informed about its Bay cleanup project, and it chose to do this by funding the Chesapeake Bay Journal with competitive grants. Though the Journal's $325,000 annual budget is a "tiny fraction" of the project's $73 million appropriation, in August 2017 EPA emailed editor Karl Blankenship to notify him that the funds would not be renewed "due to a shift in priorities," Jacob Fenston reports for WAMU-FM in Washington, D.C. The grant payment had been awarded in July and was already being processed. The future of the paper is uncertain, since 40 percent of its budget came from the EPA grant. The Journal filed an appeal and freedom-of-information requests for pertinent records, but wasn't able to figure out why its funding had been yanked. But in January, the head of the EPA's Chesapeake Bay Program in Annapolis retired, and started talking to reporters. Nick DiPasquale said that he'd heard rumors the previous summer that EPA political appointees were raising questions about the Journal grant. In an August conference call with EPA political appointee John Konkus, who was in charge of reviewing grants, Konkus said the Journal "shouldn't have weighed in" on political matters, and that "everybody knows the American public doesn't believe the press," Fenston reports. One week later, the grant was canceled. 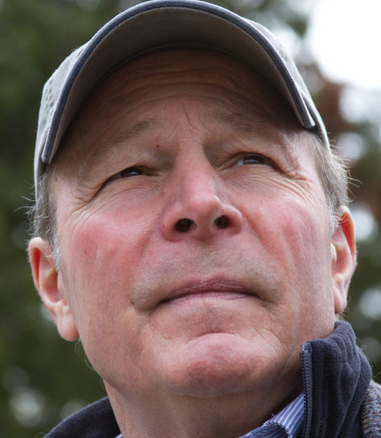 Rich Kuhlman, who worked on EPA grants for 30 years, said though he's never seen a political appointee making decisions about grants, pulling the Journal's funding may not be illegal. "The Journal isn’t alone in losing its funding. The EPA under Trump has cancelled millions of dollars in competitive grants, some for political reasons, according to the Washington Post. But there is something that sets the Journal apart from other grant recipients," Fenston reports. "As a media institution, it’s protected by the First Amendment against government retaliation for stories it has published." An attorney for legal nonprofit Democracy Forward, which is representing the Bay Journal, says the EPA's actions appear to violate the publication's constitutional rights. A 17-year-old teen from Knox County, Kentucky, has translated his love for hunting and fishing into a wildly popular video channel. Kendall Gray "started making videos of his outdoor adventures in the summer of 2016 to pass the time, but his YouTube channel has since blossomed into a dedicated online community with nearly 190,000 subscribers and 34.5 million views," Will Wright reports for The Lexington Herald-Leader. "His fans even sport their own hashtag, #GrayGang." And he gets fan mail from people all over the country, mostly from tweens and teens. Toxic waste such as arsenic may be leaking from unlined pits and contaminating groundwater at hundreds of coal-ash storage facilities around the country, says an analysis by environmental law organization Earthjustice. Electric utilities have until March 2 to publish their initial groundwater monitoring results. "The analysis, an initial review of recently released data from 14 power plants in eight states, comes as the Environmental Protection Agency is weighing whether to revise recently enacted groundwater monitoring rules at coal ash storage facilities," Phil McKenna reports for Inside Climate News. "Nine of the 14 power plants noted 'statistically significant increases"'of toxic substances in groundwater near coal ash containment ponds, Earthjustice found." James Roewer, executive director of the Utility Solid Waste Activities Group, a trade association representing more than 100 power companies, said drinking water wasn't necessarily polluted by the waste, and said that utilities finding elevated levels of contaminants will conduct extra monitoring as required by a 2015 rule. In May 2017 USWAG petitioned EPA to weaken the monitoring and remediation requirements, saying they were too burdensome, inflexible and often impractical. EPA said it would reconsider some of the provisions. Meanwhile, 15 states filed an amicus brief arguing that a federal judge's order to excavate a coal-ash pond in Tennessee "'usurps states' authority to regulate groundwaters,' and will place a financial burden on the Tennessee Valley Authority that could cause rate increases to its customers," Dennis Pillion reports for Alabama.com. The case centers on an unlined coal ash pond in Gallatin, Tenn. TVA had planned a cover-in-place strategy, but after a citizen lawsuit under the Clean Water Act, a judge ruled that Gallatin's unlined ponds didn't meet the requirements of the CWA, since pollution from the pond was reaching groundwater and the Cumberland River. The TVA argued that it would be time-consuming and expensive to dig out the coal ash and relocate it to a lined landfill as ordered. Environmental Protection Agency Administrator Scott Pruitt has long questioned the scientific consensus that the climate is changing because of human activity. But in recent months he seems to be trying a different approach, saying that even if climate change is happening, it might not be so bad for humans, Dino Grandoni, Brady Dennis and Chris Mooney report for The Washington Post. Last month Pruitt said in a Reuters interview that "The climate is changing. That's not the debate. The debate is how do we know what the ideal surface temperature is in 2100?" He repeated the line about the ideal surface temperature in 2100 in a Capitol Hill hearing later in January, and last Tuesday said in an interview with KSNV-TV in Las Vegas: "We know humans have most flourished during times of what, warming trends . . . So I think there’s assumptions made that because the climate is warming, that that necessarily is a bad thing. Do we really know what the ideal surface temperature should be in the year 2100, in the year 2018? That’s fairly arrogant for us to think that we know exactly what it should be in 2100." The recent changes have been more rapid than any ever recorded, giving nature less time to adapt, and the Post notes that rising temperatures could boost agricultural yields in some places while causing extreme drought in others. Record-high temperatures and a drought have depleted about two-thirds of the snowpack in California; farmers rely on snowmelt to water their crops, Ellen Knickmeyer and Rich Pedroncelli report for The Associated Press. And droughts increase the likelihood of wildfires, as we saw this past year, Anthony LeRoy Westerling reports for The Conversation. A North Dakota farm filed a federal antitrust lawsuit against Monsanto Co., alleging that farmers are forced to buy its expensive patented dicamba-resistant seed if they don't want their crops to be damaged by dicamba powder drifting from nearby farms. Forest River Farms' complaint, filed Feb. 1 in Missouri, says "Monsanto’s monopolization and attempted monopolization of the seeds market stymies competition, hurts producers, and harms the public at large," and alleges a class of "all individuals and entities who directly purchased seeds containing Monsanto’s dicamba-resistant trait," Eleanor Tyler reports for Bloomberg Law. 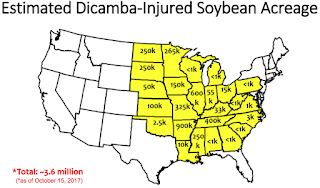 Dicamba is a herbicide notoriously prone to vaporizing into a powder and drifting to other fields. 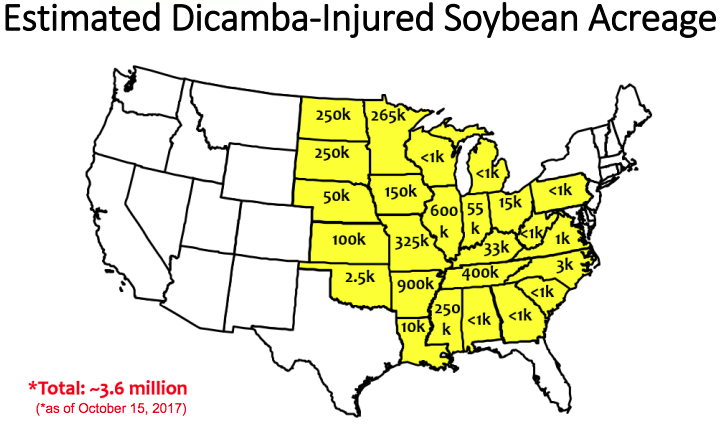 A study indicated that it damaged an estimated 3.6 million acres of soybeans in 2017 — about 4 percent of all soybeans planted in the U.S. Several states have banned its sale and use or limited when it can be sprayed. Monsanto responded to widespread complaints by introducing a new version of dicamba it says is less likely to drift. But scientists, who weren't allowed to fully vet the new product before its launch, say it's still too volatile. The new product will be available in 33 states in 2018, and on Feb. 1 Monsanto announced it will provide free mandatory training sessions for farmers on the use of dicamba in 26 of those states. Also on Feb. 1 a federal judicial panel consolidated nine lawsuits against Monsanto filed in four states, all alleging crop damage from dicamba, into the same eastern Missouri court where the Forest River Farms suit was filed. "Those cases allege that Monsanto marketed dicamba-resistant seeds knowing that would tempt farmers to use dicamba — which has proven destructive to neighboring crops — before Monsanto had regulatory approval to market its low-drift version of the pesticide," Tyler reports. In a hearing on the "State of the Rural Economy" before the House Agriculture Committee yesterday, Agriculture Secretary Sonny Perdue acknowledged that farmers are having a tough time these days. "I wish there were better news but there is a lot of stress and a lot of duress on the farms today," Perdue said. He went on to praise the resiliency of American farmers, but said that "the state of the rural economy is fragile," Andy Eubank reports for Hoosier Ag Today. "I’m very concerned that if prices continue to fall and we have any kind of an average year or below average year that we could be in some real trouble," said Rep. Collin Peterson of Minnesota, the committee's ranking Democrat and former chair. "This is one of the reasons if I had my way I’d like to see a Farm Bill that had an improved safety net going into this situation. But, with no new money, I don’t know how we’re going to do that." Perdue said part of the stress was because of the "trade environment," and noted that U.S. sorghum prices fell after news surfaced that China is investigating U.S. sorghum exports. The investigation is a warning shot after President Trump imposed high tariffs on solar panel imports, which mostly come from China. The Chinese may also investigate U.S. soybean imports. While Perdue was talking, the American Farm Bureau Federation was publishing a warning from a farmer about another big issue facing rural America: the opioid epidemic. "Our focus on national regulations and global trade are real issues that need to be addressed, but the future of farming and ranching may be just as dependent on our awareness of curbing the opioid dependency in our grassroots communities where individuals influence national changes," Matt Niswander of Lawrenceburg, Tenn., writes. "We need rural America’s farmers and ranchers to unite and remove the stigma and veil of shame surrounding opioid use and addiction, and we need additional training for rural healthcare providers to be empowered as strong advocates for non-opioid treatment options," Niswander writes. If we choose to ignore the problem, this epidemic will continue to spread, leaving a devastating impact that will undermine the current state of agriculture in rural America. Rural America’s opioid crisis is here right now." Common wisdom has held that people buy less healthful foods because they can't afford them or can't find them in nearby groceries, but new research has found that some may simply be less interested in buying healthy foods than others. "According to a new working paper from the National Bureau of Economic Research, those groups include consumers who make less money, have less education, possess lower levels of nutrition knowledge and live in certain geographic areas," Caitlin Dewey reports for The Washington Post. 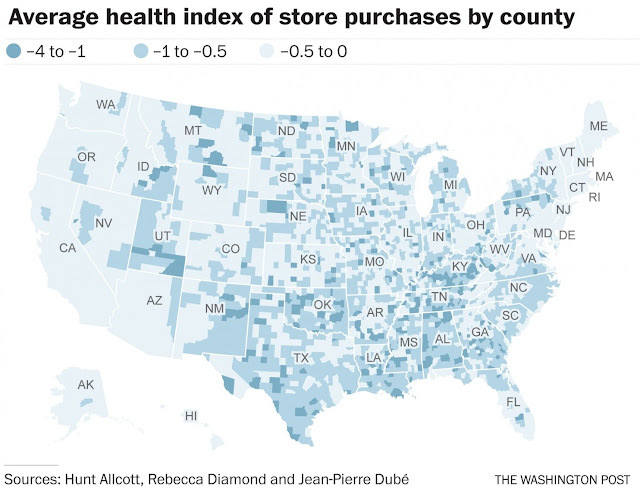 The four unhealthiest counties were Menominee County, Wisconsin; Turner County, Georgia; McNairy County, Tennessee; and Musselshell County, Montana. All four are rural. The three healthiest three counties were New York County, N.Y. (Manhattan); Pitkin County, Colorado (Aspen); and Iroquois County in east-central Illinois (Watseka, pop. 5,000).Pitkin County has one of the highest median incomes and highest life expectancies in the country. Washington Post map; click on it for a larger version. It's already known that high-income families tend to buy healthier foods than the poor, but that can't be explained entirely by cost or availability of healthy food. The paper, which hasn't completed peer review, analyzed 12 years of Nielsen grocery-purchase data from 100,000 households across the U.S. The researchers studied what happened to a household's food purchases when a new grocery opened nearby, or when the household otherwise was no longer in a "food desert" without easy access to fresh produce. They found that such changes had a limited impact on the foods those households bought, so it may have been more about demand than access. However, the researchers stress that there were factors the study didn't consider, including the time to plan and cook meals, exposure to food marketing, and stress levels. Lead researcher Hunt Allcott, an economist at New York University, "hypothesizes that a region’s dominant cuisine, be that barbecue or avocado toast, informs the meals that people eat as children. That, in turn, has a large effect on their lifelong food preferences," Dewey reports. "For decades, pollsters have called it the Cascade Curtain, the apparent voting-habit divide between Western and Eastern Washington. 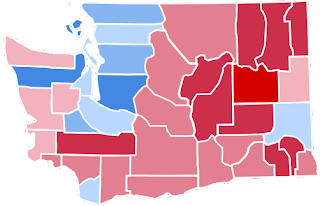 Eastern Washington votes Republican, the idea goes, while the state’s Pacific coast and Puget Sound counties tilt liberal. . . . But it might be time to shove aside that curtain for good, political scientists say. Recent voter polls, election results, and economic data reveal that Washington’s divide now is urban and rural, not east-west," Mike Lewis reports for My Northwest. Longtime Washington state pollster Stuart Elway "said the shift became abundantly clear in the 2016 elections and more so with every poll he’s done since. Coastal counties that had not voted for a Republican since Herbert Hoover voted for Donald Trump," Lewis writes. 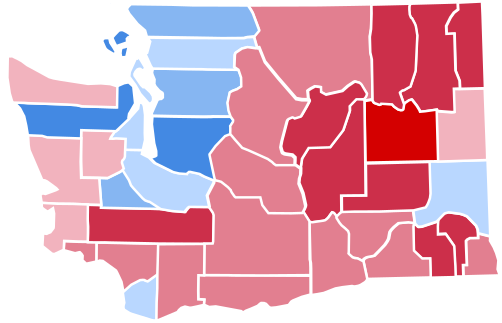 Hillary Clinton carried the state, on the strength of votes from the four counties around Puget Sound, where 54 percent of voters live. Three of those counties are "net donor" counties to the state, meaning they give more in taxes than they get back in spending, but rural voters think it's their counties that are getting the short end of the stick, Elway has found in his polling. "Only 12 percent correctly answer that their county gets more back than they put in," Elway told Lewis. A similar phenomenon was noted in rural Wisconsin focus groups by University of Wisconsin Professor Katherine Cramer for her book, The Politics of Resentment. West Virginia legislators are moving a bill to "create a last-dollar benefit to cover the outstanding costs of tuition and mandatory fees not covered by Pell Grants or other grant aid," Adam Harris reports for The Chronicle of Higher Education. But there's a catch: prospective students would have to pay for, and pass, a drug test to qualify for the scholarship. That's kicked up some controversy in a state hard-hit by the opioid epidemic. Sponsor Mitch Carmichael, president of the Senate, which passed his Senate Bill 284 unanimously, said "From a state perspective, it helps us say to the world that our work force is drug-free, trained, educated, and ready to go to work." He also says it provides an incentive for people to be drug-free. Critics say it's unclear how the state will carry out the testing, and whether a student would be excluded for taking legally prescribed painkillers or medication-assisted treatment drugs, which are opioids that prevent an addict from going through withdrawal. The Minnesota Department of Agriculture launched a six-week workshop series last week to educate rural law enforcement and the public about mental-health issues affecting farmers. A 2017 University of Minnesota study found that suicide rates among farmers are three to five times higher than all other occupations. "The 'Down on the Farm' sessions, sponsored by the university's Cooperative Extension Service, will teach people in farming communities to recognize the warning signs of mental and emotional distress and provide information about resources that are available to farmers," Katrina Pross reports for the Minnesota Daily. Minnesota Sheriffs' Association Deputy Director of Professional Development Randy Willis will present the workshops. 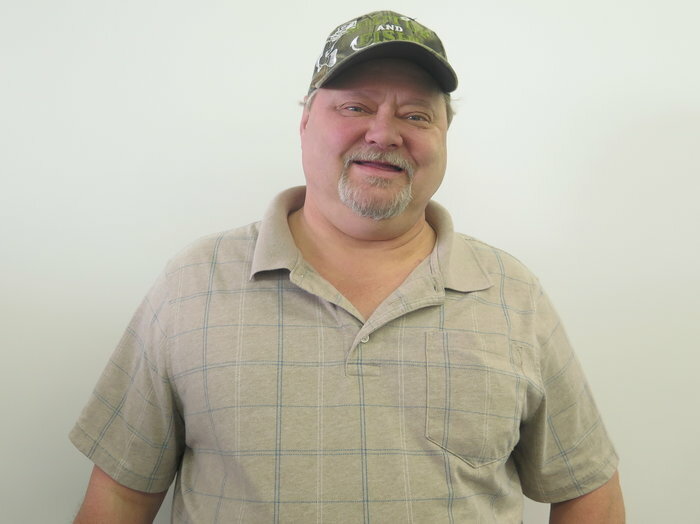 He says sheriffs need to known about mental-health issues because they're the primary law enforcement in farming communities, and he hopes they'll learn more tools to help farmers before a mental health problem becomes a crisis. Farmers in tight-knit communities often don't feel like they can trust health care professionals, and often don't feel like they can take the time out of their busy schedules to go to counseling, according to agriculture-department Director of Mental Health Outreach Ted Matthews: "The planting and harvest system is not easy for them, and the uncertainty that comes with farming can cause a lot of stress and anxiety." 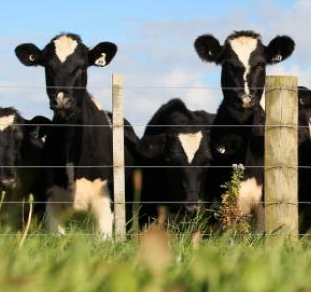 Last October the department launched a 24/7 mental-health help line for farmers, which Matthews said has been successful. The Federal Communications Commission "has taken the final steps toward finally opening its long-delayed Connect America Fund II, which will disburse $2 billion in federal money over 10 years to support new broadband infrastructure in rural areas throughout the country," Devin Coldewey reports for Tech Crunch. FCC Chairman Ajit Pai has made rural broadband expansion a priority, but he's tried to declare an easy win with failed attempts to redefine what counts as broadband: first he tried to lower the threshold for broadband to include service with a download speed of 4 megabytes per second, instead of the current 25 Mbps. Then he tried to conflate smartphone data plans with broadband. Both those proposals would make it look as though much more of rural America receives broadband access than actually does. President Trump promised more attention to the nation's infrastructure in his State of the Union address, but Blair Levin of The Brookings Institution writes that his infrastructure plan isn't likely to help with rural broadband expansion. For a comprehensive look at the current state of rural broadband, check out this article by Sharon Strover, an academic who has been out front on the issue for more than a decade. Less than two weeks after President Trump imposed steep tariffs on solar panels, most of which come from China, and two months after his administration's decision to investigate trade in Chinese aluminum-alloy sheets, China launched a probe into U.S. sorghum imports -- a pointed reminder that U.S. farmers are likely to suffer in a trade war. "On Sunday, the Ministry of Commerce launched an anti-dumping and anti-subsidy investigation, potentially leading to hefty tariffs on imports of the ingredient used in livestock feed and the fiery Chinese liquor baijiu," Dominique Patton and Michael Martina report for Reuters. "Taking aim at sorghum at a time when the global grain market is in surplus and growers around the world are scrambling to find homes for their products hits at Trump's core political base while avoiding damaging supplies of a product critical at home." The U.S. imported more than $1 billion worth of sorghum to China last year, making up more than 90 percent of the total sorghum China imports. Most of it comes from Texas and Kansas. A trade war would likely hurt U.S. soybean growers too. Soybeans are the U.S.'s most valuable agricultural export, valued at more than $12 billion last year. "They believe that if they ratchet up the heat in key red states where there's a large agricultural community that's voted for Donald Trump that it will somehow change the situation," Paul Burke, Asia director at the U.S. Soybean Export Council, told Reuters. "Epidemiologists at the National Institute for Occupational Safety and Health say they've identified the largest cluster of advanced black lung disease ever reported, a cluster that was first uncovered by NPR 14 months ago," Howard Berkes and Adelina Lancianese report for NPR, saying it reflects "a kind of mining disaster in slow motion" in the Central Appalachian coalfield. complicated black lung. He told NPR, "I can't breathe, you know.
. . . all I got to look forward to is to get worser and worser." "In a 'research letter' published today in the Journal of the American Medical Association, NIOSH confirms 416 cases of progressive massive fibrosis, or complicated black lung, in three clinics in southwestern Virginia from 2013 to 2017." The clinics also treat miners from Kentucky and West Virginia, for a disease that gradually takes away the ability to breathe. "Lung transplants are the only cure, and they're possible only when miners are healthy enough to qualify," NPR reports. "We've gone from having nearly eradicated PMF in the mid-1990s to the highest concentration of cases that anyone has ever seen," Scott Laney, a NIOSH epidemiologist on the study, told NPR, which says it has found "that the likely cause of the epidemic is longer work shifts for miners and the mining of thinner coal seams. Massive mining machines must cut rock with coal and the resulting dust contains silica, which is far more toxic than coal dust." Another reason, NPR reports, is "layoffs and retirements brought on by the decline in coal mining. Miners who put off getting checked for black lung earlier began streaming into clinics, especially if they needed the medical and wage replacement benefits provided by black-lung compensation programs." Norton, Va., lawyer Joe Wolfe said the federal government needs to declare a public-health emergency for the 50,000 miners still working. "New federal regulations that are supposed to limit exposure to dangerous levels of coal and silica dust were fully implemented in 2016, a few months before NPR first reported the PMF epidemic," Berkes and Lancianese report. "The Trump administration recently announced a 'retrospective study' of the new regulations, which has mine safety advocates concerned, especially given the epidemic of the disease caused by mine dust." In a victory for the Environmental Protection Agency, a federal appeals court ruled that the agency has until May 1 to begin requiring livestock farmers to report animal-waste emissions. The mandate was scheduled to take effect Jan. 22, but the EPA filed a motion on Jan. 19 arguing that farmers weren't ready to meet its requirements. "The delay follows a court decision in April that the EPA must force farms to report air pollution for animal waste emissions. The decision invalidated a previous policy under then-President George W. Bush that exempted most farms from such reporting requirements," Miranda Green reports for The Hill. Most facilities are required to report emissions to federal, state and local authorities, "but the EPA, under Bush, decided that it could not do anything to reduce or mitigate emissions from animal waste and that requiring reporting would not be useful." Measuring emissions can be tricky, especially for large-scale feedlots. The EPA promised to start keeping tabs on feedlot emissions 11 years ago, but hasn't been able to do so effectively because it hasn't settled on a consistent method of measuring data. It's difficult to get meaningful data if feedlots aren't measuring their emissions the same way. The deadline for nominations for the Black Hole Award is Feb. 16. The award was established by the Society of Professional Journalists to draw attention to the worst violations of the public's right to know about a news story. Nominations can be from local SPJ chapters, SPJ members, other journalists or private citizens. Click here to read more and to see a list of previous winners. 1. Violation, in spirit or letter, of any federal or state open-government law. This means either a clear violation of the statute governing access to public records or public meetings, or using an ambiguity or loophole in the law to avoid having to comply with the law. For example: conducting multiple meetings with small groups that do not constitute a quorum, email discussions outside the public view, or charging unreasonable amounts to copy documents. 2. Egregiousness. In order to maintain the effectiveness of the Black Hole Award, it should not be given for just any openness violation. Recipients should know they are trampling on the public’s right, placing personal or political interests ahead of the public good or endangering public welfare. Examples might include an agency or official who attempted to keep information secret to avoid embarrassment or hide misdeeds. 3. Impact. The case should be one that affects the public rather than an individual. The award should not be used to settle vendettas against recalcitrant bureaucrats. Withholding information should hurt the general public rather than an individual. News coverage of the violation. Public records chronicling the dispute. Legal papers if there was a lawsuit or other legal action involved in the matter. Any expert opinion from an attorney, official or open-government expert that the violation occurred. Contact information for the parties involved to allow the committee to obtain more information if needed, including from the government official. 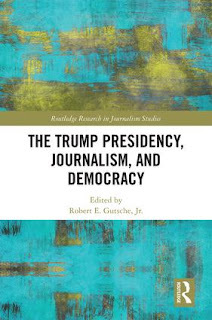 A book published today by Routledge — The Trump Presidency, Journalism and Democracy — includes a chapter about Donald Trump, rural America, its issues and the national news media’s failure to recognize the power Trump drew from rural voters. Written by Al Cross, director of the Institute for Rural Journalism and Community Issues, publisher of The Rural Blog, the chapter digs deep into the issues at play in rural America and how some of them influenced rural Americans to vote for Trump. Rural America has a declining population, a slow rebound from the Great Recession, higher divorce rates, poorer health, and higher mortality rates -- especially from drug overdoses, suicide and alcohol. "Also in rural America, there is a documented resentment of urban elites, including the news media, reflecting a feeling that rural areas aren’t getting a fair shake from government and its trade deals, and that they are looked down upon," Cross writes. And rural voters resent feeling like city folks view them as ignorant racists. By validating this rural resentment, Trump captured the hearts of rural Americans to an extent that Cross, a columnist and former political writer for the Louisville Courier Journal, says he hadn't seen in 40 years of covering politics. Trump got 39 percent more of the working-class vote than Hillary Clinton, and he did best in the rural areas where people were the worst off. Cross dives into polling data and anecdotal signposts to divine what attracted voters to Trump. Research showed that Trump voters were more likely motivated by issues of race, ethnicity and immigration than economics. A poll showed that Trump voters were much more likely to agree that white people can't find jobs because employers are hiring people of color; another poll showed that rural voters were worried that they're losing their culture because of immigrants. But economics was important for some Trump voters: 60 percent of working-class Americans believe that free-trade agreements are mostly harmful because they send jobs overseas and drive down wages. Another poll showed that jobs were not likely to be a big motivator for supporting Trump. Respect for an authoritarian leader was the biggest indicator of support for Trump. That especially applies to white evangelical Christians, who tend to view the world through an authoritarian religious lens, and white working-class Americans who don't have a college degree. Trump won 81 percent of the votes of white evangelicals. Trump also picked up a lot of pro-gun votes, as well as a much-needed $30 million from the National Rifle Association. In addition to campaign money, the NRA helped Trump by stoking voters' fears that gun rights were in peril. Rural outreach and media dominance was another big reason for the vote turnout. Clinton dedicated little time or resources to rural outreach, though she issued a relatively detailed rural policy platform. But Trump won out on the rural media battle with anti-elite talking points and a huge media push on rural-centric RFD-TV in the last weeks before the election. His campaign also made a deal with the conservative Sinclair Broadcast Group, which is the nation's largest owner of TV stations: in exchange for more access to Trump and his campaign, Sinclair agreed to shoot and distribute extended interviews with Trump to other stations, often rural, to run without commentary. Sinclair said Clinton declined the same deal. National news media were slow to realize the extent of Trump's rural dominance, though it was a major source of navel-gazing on election night and afterward. Chuck Todd of NBC News looked at a map of counties going red and said, "Rural America is basically screaming at us, 'Stop overlooking us!'" Some major media outlets have responded with a variety of efforts to take the pulse of rural America. The outgoing Republican governor of Tennessee told the state's newspapers Thursday that he worries the race to succeed him, and other big elections in the Volunteer State this year, "won't be covered in the detail they traditionally have" because "there are a lot fewer assets in your world to work with." "This is going to be a really important political year," Gov. Bill Haslam said at the Tennessee Press Association convention in Nashville. "This is a real governor’s race. We have a Senate race that’s really important, not just for the state, but the country, right? And a number of congressional seats in play. . . . Not just a free press, but an active and engaged press, matters." He said that is even more important than usual because "You're going to see unheard of outside money pouring into the state." Andy Sher reports for the Chattanooga Times Free Press, "The governor said that 'as a candidate, you don't always like' the news coverage, but he believes it ultimately makes 'the process of running so much better. And the media is really an incredible part of the process.' Haslam, who noted he reads five print newspapers daily, also voiced concerns about what he hears from people he talks to, particularly those under age 35, about where they're getting their news." 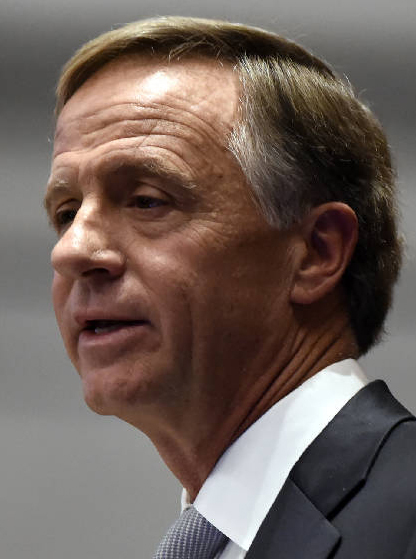 "Haslam said when he asks most people where they get their news, many name dubious sources without editors," Jordan Buie reports for the Nashville Tennesseean. The governor said, "The answers are really discouraging to me." After his term as governor, "Haslam said he would be interested in doing 'something that helps people understand their state and local news in a better way,' and to facilitate an unbiased national conversation. "I think there is something interesting there," he said.